Supreme endowed having high algorithm an keenest OST to PST Export tool faultlessly repair extremely damaged or corrupted offline Exchange OST file and recover offline OST file along with all emails and attachments. Outlook OST Export to PST Software allows export either selective Items or complete items of OST file to PST file. Fast conversion:- Software has fast, secure and reliable process to export outlook OST file along with Emails, Contacts, Calendars, Notes, Tasks, Journals etc. Recover/Export Deleted Folders Emails: - OST Export tool capable to recover "Deleted Folders Emails" of Outlook OST file to PST with complete email data. 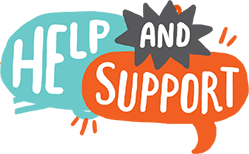 Several Formats to Export OST file: - Software allows to recover & Export OST to PST file, EML, MSG, HTML, EMLX and vCard (vcf) format. No Outlook Required:- Users don’t require to install MS Outlook application om computer to perform OST to PST export. Export Selected OST folders:-OST to PST exporter software allows to select only required folders and made conversion into PST, EML, EMLX, MSG, HTML and VCF file. OST file viewer: OST Exporter provides email preview of recovered OST items to ensure their recovery quality. 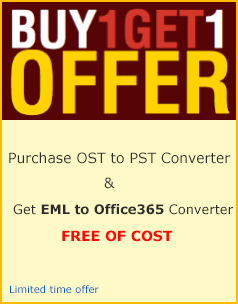 OST to PST export tool fastly finishes conversion process without any interruption. Preserve Folders Structure:- Software will not harm internal structure of OST file data while OST export to PST. Create Unicode PST file:- Software will create UNICODE PST File that can supports all versions of MS Outlook such as- 97/2000/2002/2003/2007/2010/2013 and 2016. Demo version ost to pst export, recover ost file and save 25 items from every folders. Outlook OST to PST Export Software that instantly fix OST file errors such as- Error code 0x8004103b, OST Internal error (error code=00000003), Service-specific error 0 (0×0) and many more and recover OST file included Emails, Contacts, Calendars, Notes, Tasks, Journals items. OST Exporter software provides selective folders conversion as well as complete items from OST and Export Outlook OST to PST file. Software performs largest sized of OST Recovery and export entire items including OST Emails with properties (To, Cc, Subject, BCC, Date/Time & Attachments), Contacts, Calendar, Notes, Tasks, Journals and users created folders and sub-folders. 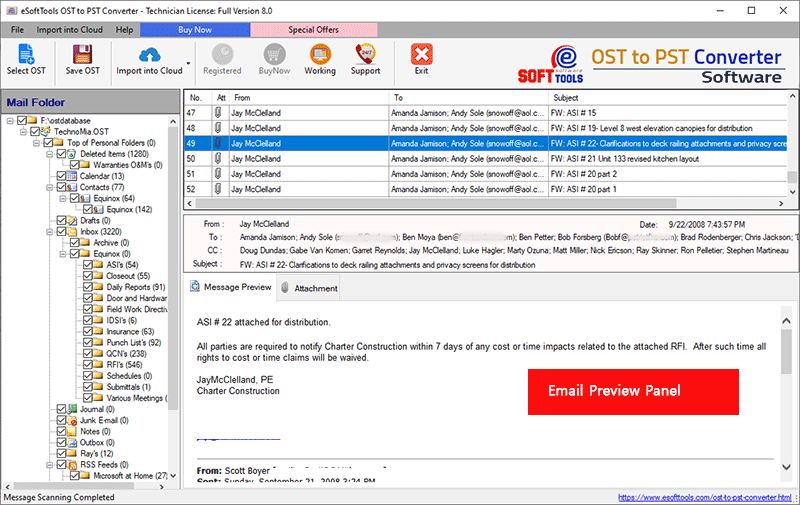 OST to PST Exporter Software shows all recovered items in tree like hierarchy within software. For selected conversion, user must checked the folders from tree hierarchy and proceed the OST export process. OST Export Tool provides the facility to export ost emails into numerous conversion options like- OST to PST Export, OST to EML Export, OST to MSG Export, OST to VCF Export. All conversion options preserve email meta-data & properties during conversion. OST Export to PST Software fully compatible to restore email data from "Deleted Items Folder". During OST Recovery process, all "Deleted Items Folder" recovered and previewed clearly. Now user can select the "Deleted Items Folder" and export ost emails to Outlook PST, EML, EMLX, MSG file. While performing export outlook ost to pst, the OST Export tool takes care about original OST file internal structure. It maintains OST folders, sub-folders hierarchy and emails formatting such as- emails properties, embedded images and email header information etc. 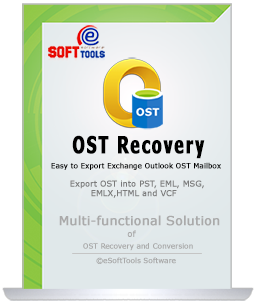 export outlook ost file to pst software provides clear preview of every recovered OST items including emails, contacts, calendar, notes, tasks etc.. User can see individual OST items with preview to ensure about ost recovery quality. With updated feature of OST to PST Export Software now you don’t need to install MS Outlook application on machine because without outlook environment, eSoftTools Export OST PST software has capability to produce Export OST to PST process. The demo version of eSoftTools OST to PST Export Software allows to analyze unlimited size of OST file, see preview and export 15 items from every OST folder. Demo Limitation - Free Demo Version Export OST to PST Software facilitates to export 15 items from OST to PST, EML, EMLX, MSG, HTML and vCard file. Verifies to load selected OST file and ready to exoprt ost file. Software Ready to Export Outlook OST to PST File. How many OST file can I convert into PST in single conversion? You can convert only single OST file at a time, once the OST file conversion process is completed then you can export another ost file. How much time will the OST to PST Export take for complete conversion? The conversion time of the software will be depended on the size of your OST file. Can I Convert selected items from offline corrupted 2013 OST file into Outlook? 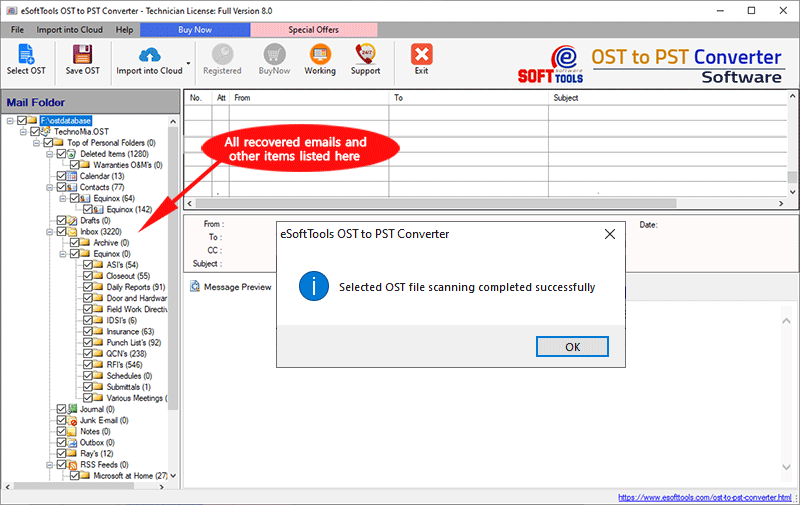 Yes, with eSoftTools OST to PST Export Software, you can recover and convert selected folders from corrupted 2013 OST file into outlook PST as well as other formats. Do I need to Install MS Outlook Application on machine to Export OST to PST file? No, you don’t need to install Outlook application; without Outlook OST exporter software works perfectly and makes successful OST to PST Export. What are the conversion options/ formats? Export OST to PST file Software provides multiple conversion options for OST export. There are currently 6-variation availalbe to export ost file. These are- OST to PST, EML, EMLX, MSG, HTML and vCard (vcf). 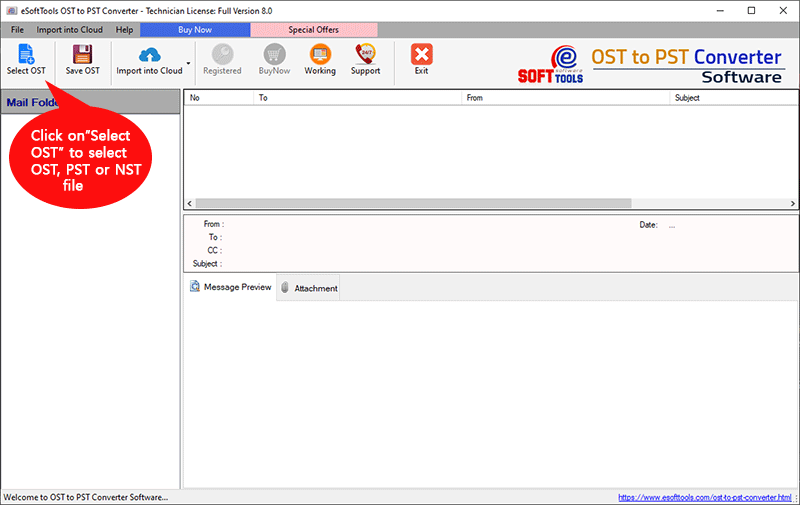 I have used your OST to PST Export Software and found that its working steps was too easy to operate; very easily I used this and got perfect conversion of my OST file to PST Outlook file.. I want to recommended this program to all users who required OST to PST Export..Thanks a lot. I am happy after using Outlook OST Export Tool because it allowed me to convert selective folders from OST file along with emails, contacts, calendars, task, notes and appointments. Without outlook installation I have used the software and convert all my OST file to PST and vCard file thanks a lot..